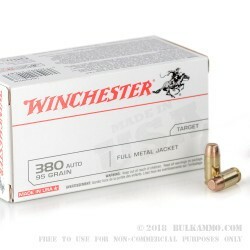 A great training round, the Winchester White Box .380 is packaged in a 100 round value pack for long range sessions, at a very reasonable price. 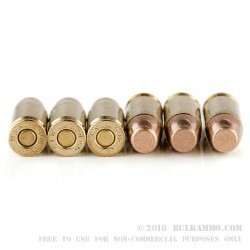 The 95 grain projectile is a FMJ (full metal jacket) flat nosed bullet with a moderate powder load behind it. Many of the newer .380’s are very heavily sprung for recoil and need to either be broken in or tuned to a specific load for ammunition. 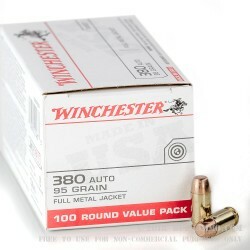 More than most loads, this inexpensive Winchester white box is pretty good with newer .380’s. Sure there are a few that won’t cycle new out of the box, but generally this is a very versatile, reliable, and amenable ammunition to heavy spring scenarios. A very nice round that functions in a huge range of pocket guns and in most all of the newer full sized .380’s, this is a fantastic round to take to the range and for tactical training once you now it works for you in your chosen firearm. The price is right, the powder is relatively clean; the reloadable brass makes a lot of sense and there are no real reliability issues outside of what is listed above. Suitable for use in all .380 Auto firearms made in the modern era. 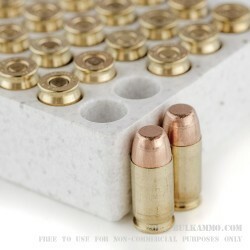 need to order full ball ammo for my G42.